Egyptian artist Omar el-Nagdi passed away last Friday at the age of 88 after an illustrious career that spanned sixty years total. Born in Cairo in 1931, el-Nagdi received first place in the competition of the Faculty of Fine Arts in Cairo as a 21-year-old in 1952. He graduated from Helwan University with a degree in fine arts, having studied under Ahmed Sabry. He studied ceramics in Russia and later received a Higher Diploma at the Fine Arts Academy of Venice, studying under Professor Bruno Saetti. He also received a diploma from the Ravenna Academy of Art. La Pharaonne (1994) — Oil on Canvas by Omar El-Nagdi; Image from Christie’s. 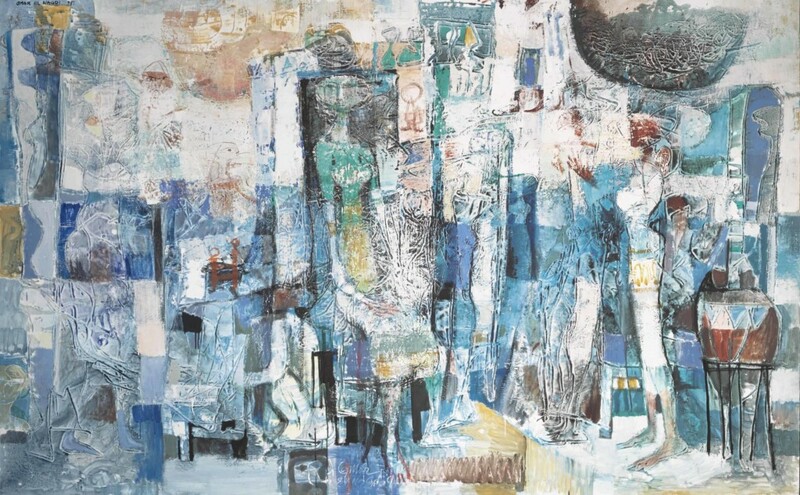 Many of El-Nagdi’s paintings have been acquired by museums, and he previously participated in numerous exhibitions and Biennales throughout Egypt and Europe. He has collections in France, Italy, the Netherlands, the U.S., Venice, and South Korea. Through the numerous media in which he worked — and he also was a musician and philosopher on top of being a visual artist — El-Nagdi experimented with different linkages between traditional arts from historical Egyptian civilizations — including Pharaonic, Islamic, Coptic, and other Eastern forms — and interpreted their meanings through his unique vision. 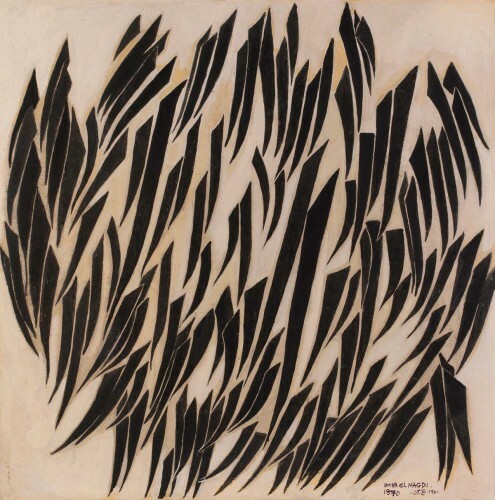 He also became known for his works utilizing calligraphic forms of Arabic, which began in the 1960s while he was still at the Academy of Fine Arts in Venice. He was inspired by Sufism and the “constant repetition of one word,” conflating that with the constant rotation of Sufis in mystic dance. UNTITLED (ONE) “El Nagdi’s practice creates rhythmic abstractions based on the repetition of the Arabic numeral for ‘one’ (wahed), which shares its form with the first letter of the Arabic alphabet, alef. With minimal form, El Nagdi builds a pulsating and multi-dimensional composition that symbolises the indivisible nature of the divine.” Image and description from the Barjeel Art Foundation. El-Nagdi’s work also bore influence from Cubism, which he called a “Cubism of [his] own,” distinct from Barak, Picasso, and other famous Cubist works. El-Nagdi is perhaps most well-known in the world for his painting “Sarajevo,” which was the top selling artwork from the Middle East at auction from a live artist at $1,145,000. The painting is 11 meters wide by 3 meters tall and was created in 1992 during the ethnic cleansing of Bosnian Muslims by Serbs during the Serbo-Croatian-Bosnian conflict of 1990-1994. 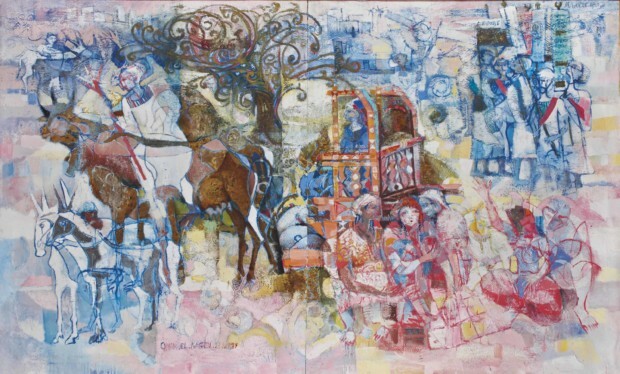 (Click here for larger image) Sarajevo (1992) — Oil on Canvas in three parts by Omar El-Nagdi. Image from Christie’s. This painting is the highest selling work of art from the Middle East at auction from a living artist. “Works like Sarajevo are the most expressive documentation of life. With its stark imagery of suffering and dark earthy tones punctuated with turquoises and reds, it’s impossible not to feel compelled to do something,” said Middle Eastern Art specialist Masa Al-Kutoubi in an interview with Christie’s. El-Nagdi is remembered today as an artistic tour de force, capable of powerfully capturing the full gamut of human emotion and of linking Egyptian traditions and contemporary existences across time and space through his significant oeuvre.